Yazhou folk song is one of the ancient styles of Hainan folk song. It is popular in Sanya, Huangliu village of Ledong county and the affiliated territory to ancient Yazhou. The old Yazhou folk song is still popular today. It is a kind of Chinese ballad intonated in Hakka dialect. The folk song has extremely precise rhythm and is an independent integration, originating from countryside of "West Six Kilometers" in ancient Yazhou and spreading all around. Yazhou folk songs have extensive materials and rich contents. Most of the lyrics consist of seven characters, involving all fields of social life, such as humanity, history, landscape, production and labor. There are more than one hundred pieces of narrative long poem found. They are the rarities of Yazhou folk songs. The melody of Yazhou folk song is graceful and pleasant. It contains work song, peddling tone, major key, tender key, sign tone, minor key, etc. Common songs include Seeing off the Beau Ten Times, Song of Scholar Liang, Song of Scholar Zhang, Meng Lijun, Park of Spring Forever and so on. Two factors contributed to the formation of Yazhou folk song: one was the continuous settlement of the migrants from central China, who brought folk songs into Yazhou from various regions; the other is that after the migrants living together for a long time, local accent and folk custom of Yazhou came into being, and then evolved or generated the vulgar, strong dialectal Yazhou folk song with considerable local colors later. Firewood gathering dance is the representative folk dance of Li Minority, called "Zhuancha" and "Taicha" in Li’s language. 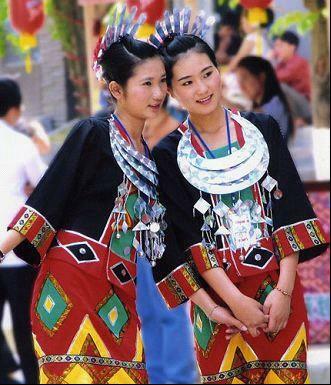 It originated from Li’s funeral custom in ancient Yazhou Prefecture (today’s Sanya City of Hainan Province). It is a dance for ancient Li people to protect corpse after someone died, to drive beasts away, to help someone get over a shock or to worship their ancestors. Presently, there is a funeral custom called "Hansai" in Li villages, that is to say, a corpse is placed in coffin for 12 days, 24 days or one month before being buried. 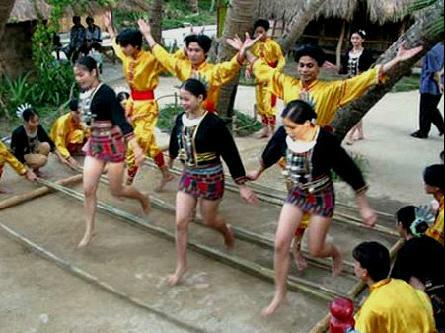 In such a period, the dead person’s family members and relevant people in surrounding villages will come to the family and dance every evening. 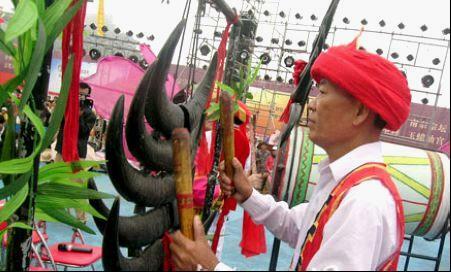 Firewood gathering dance is also called "bamboo pole dance". On a grain-sunning ground or a piece of level ground on hill side, two square woods as thick as a man’s leg are placed in parallel with a certain interval to work as the cushion rack, across which several long bamboo poles as thick as a man’s wrist are put. Pole holders hold one end of a pole with every hand respectively and knock the poles on cushion rack or other poles to produce rhythmical sounds, called "firewood gathering". A dancer or dancers will jump into the poles, skip back and forth, squat, and imitate human beings’working scene or various animals’actions and noises. Li people are good at weaving brocade. Exquisite Li brocade has a long history. Men usually wear collarless jackets with buttons down the front, along with aprons and trousers. They wear their hair in a bun, while earrings are worn in some areas. Women wear jackets with buttonless opening down the front or "Guantouyi" pullovers and tight skirts. They gather their long hair on the back of their head with bone hairpins and embroidered head kerchiefs, and wear various ornaments. Hainan coconut carvings enjoy a long history. As early as the Tang Dynasty, people began to create wine cups using coconut shells. During the late Tang Dynasty, Lu Guimeng, a poet, wrote a famous poem concerning the coconut wine cup. In the Ming and Qing Dynasties, Hainan Province sent yearly tributes of coconut carvings to Beijing. Hainan coconut carvings create craftwork from coconut shells by carving craftsmen in Hainan Island. 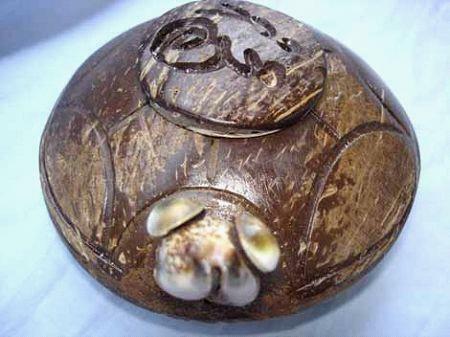 The coconut carvings are of different patterns, are simple and elegant in color, and have a specific artistic style. As early as the end the Ming Dynasty and the beginning of the Qing Dynasty, coconut carving craftwork reached a high standard. In the following 300 years, craftsmen gradually developed the craftsmanship into perfection after their continuous hard work, and they finally formed their own specific style.